St. Albert the Great has an outstanding academic program as evidenced through our success in standardized testing, as well as our graduates' success in high school and beyond. Highly qualified teachers with multiple years of experience and advanced degrees. Strong parent involvement creates an environment where students are expected to learn and are supported in their learning. Variety of programs that meet the needs of students at all developmental levels. Children learn and progress, at a rate determined by individual abilities and achievements, in a positive and caring atmosphere. Children grow in self-discipline and responsibility. 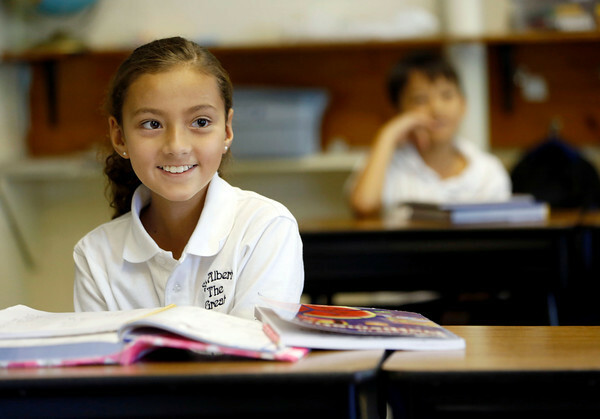 All grade levels receive instruction in religion, reading, English, spelling, mathematics, social studies, science, computer, art, and physical education. Opportunity for instruction in foreign languages. An extensive library, as well as technology for learning, research, and other academic endeavors.